Everyone reduces down at different rates (yes you knew I was going to say that). However, there are general rules and guides you can use to guesstimate what you can expect. Here we’re going to get into the factors that might affect your waist / corset training reduction time as well as the general rules for what to expect. Also don’t forget that there’s more advice on corset training on the main Corset Training page. But first a warning on why going too fast is actually a waste of time. It is all-important that you progress gradually with any waist reduction, corseting is a long term process and it takes many hours a day over many months for your body to change. It’s not easy with our modern culture of wanting things now and expecting things yesterday, but you need to be patient when corset training. Even an extreme reduction shouldn’t cause discomfort. The key is to listen to your body. So why is reducing your waist faster actually a waste of time? Well for two reasons; firstly it’s not possible to maintain an uncomfortable level of waist reduction. If you’re corset training down to a size you’re not used to, you won’t be able to maintain it for 8+ hours a day. You’ll also end up hating wearing your corset trainer and you need to enjoy the process of waist corset training in order to stick to it for months/years. Yes it should be enjoyable, but we’ll get to that in a bit. The second reason? Because you’re very likely to do yourself a mischief if you’re not reducing sensibly. Sores, muscle spasms and aching ribs will likely ensue. I’d like to do away right now with the myth that corset training involves any kind of suffering. 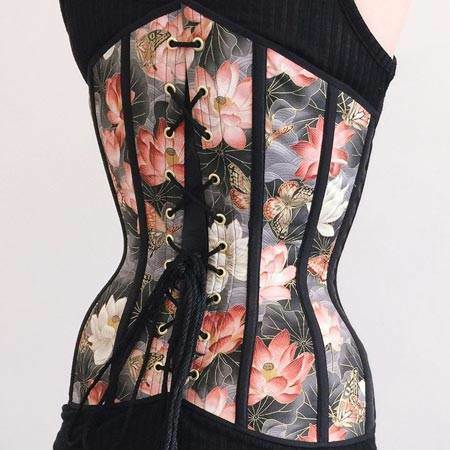 Wearing a corset should feel comfortable, unrestrictive and it should be easy to almost forget you’re wearing it. So don’t force your body smaller than is comfortable. Work with what feels right. Your waist corset should feel supportive and your body should feel ‘hugged’, not like your fighting against a death grip! If it hurts in any way you’re doing it wrong! Now as for timescale, waist reduction can be affected by a lot of factors. Working out what you personally can expect involves a mixture of assessing your body, being realistic about the hours you’ll be wearing your waist training corset and having a basic knowledge of what to expect from the process. Obviously your body will naturally take a larger and larger reduction over time. Generally the first 4 inches or so are the easiest to loose and can be done so in a matter of months, but it becomes increasingly difficult after that. You can expect to loose the first 2-3 inches immediately just from putting on a waist training corset (this won’t be permanent when removing your corset for many months). You can expect to loose a further 1-2 inches within a few week/months. After that things slow down. The smaller you go, the longer it will take to achieve the next inch. If you go right down to 20 inches and below, a half inch can take a year (this also depends on your frame of course but we’ll get into that next). Health Note: If you’re going that small then it’s a very good idea to let your doctor know what you’re doing so they can monitor your health. Always put your health before your vanity and consult your doctor at the first sign of trouble or pain. You should have regular checkups when reducing down very small, say over six inches smaller than the normal waist size for your age. There are a number of personal factors you can use to give you a good idea of how you’ll fit into the above rough timescale. The main ones being time spent in your training corset and your body fat mass. If you can’t find 8-10 hours plus to wear your corset each day t’s going to take you longer to see results. As for fat mass if you carry a lot of fat on your torso, after the initial loss (which will be more substancial as fat is extremely squashy) you won’t be able to get down to those smaller sizes without difficulty. However if you’re loosing weight and tight lacing, your weight loss and the speed at which you loose it will mean a dramatically different inch reduction in comparison to someone who remains the same overal weight. Combining corset training with dieting is a great way to improve your progress at both. Muscle will also play a big part as this doesn’t squash so easily. A lean person will progress slower as a result. If you’re petite and have a tiny waist to begin with, you also won’t be able to reduce as much as someone who’s say a foot taller and had a naturally bigger waist to begin with. Use common sense and don’t become blinkered by the tape measure. A common misassumption it that corset training for just a few months can permanently reduce your waist size. Unless you’re using it as a weight loss aid then no it can’t, sorry. However, if worn for a number of years yes the corset can keep you thinner than you naturally would have been at that point in your life, had you not worn a waist trainer corset. We all get bigger round the middle naturally as we age unless something’s there to physically stop us. But even after corset training for years, you’ll find that just a few uncarpeted months will result in a noticeable waist expansion. Waist reduction should be gradual and progress is affected by many things. However there are some general rules i.e. the first 4 inches are the easiest to loose and can be done so in a matter of months. anyway, this might be a silly question but can men use corsets for weight loss as well? Yes, men can use corsets for weight loss the same as women, as it restricts their stomachs in the same way.